It finally happened: After months of anticipation, the royal wedding day is here, and Prince Harry and Meghan Markle are officially married! There was a bit of family drama leading up to the wedding, but hey — what wedding doesn’t have its fair share of family drama? Meghan Markle’s father couldn’t make the royal wedding, but she was still surrounded by a lot of love. Instead of her father walking her down the aisle, Markle walked herself (with a little assistance from Prince Charles). It was a bold feminist statement and we appreciate how she continues to challenge royal protocol. Markle’s mother, Doria Ragland, accompanied her in the car to St George’s Chapel. Even on such a happy occasion, it’s hard not to think about Prince Harry’s mum, Princess Diana, during her son’s big life moments. We thought about Princess Diana when Prince William and Kate Middleton wed in 2011, and we are thinking about her today. During the royal wedding ceremony, it appeared as if Prince Harry was honoring his mother in a beautiful way, by leaving an empty seat open for her where she would have been sitting next to Prince William. We’re not crying, you’re cr…okay, we’re sobbing. Twitter was first to call out the empty seat, theorizing that it was left empty to honor Diana. While the reason for the empty seat has not been 100% confirmed, E! is suggesting that it was not meant for Diana, but rather because Queen Elizabeth was sitting right behind the vacant seat…and she needed to have an unobstructed view of the ceremony. 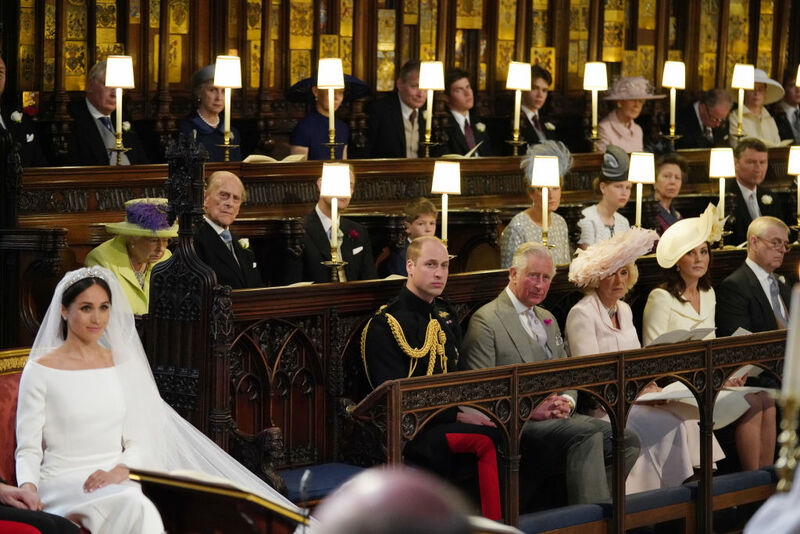 Whether this empty seat honors Diana or not, there were a few other nods to the late princess at the wedding: Harry’s aunt, Lady Jane Fellowes, gave a special reading during the ceremony. Previously, the couple announced that Lady Jane would be helping celebrate the memory of the late princess. Markle’s bouquet included a little nod to Princess Diana as well. In fact, her flowers were handpicked by her new husband Harry, who chose to include some of Diana’s favorite flowers. According to Town & Country, he included Forget-Me-Nots for his mother. "The spring blooms include Forget-Me-Nots which were Diana, Princess of Wales' favorite flower. The couple specifically chose them to be included in Ms. Markle’s bouquet to honour the memory of the late Princess on this special day." We are so happy the couple found special ways to honor Princess Diana at their wedding. And we’re so happy for them, because we know that the late princess is smiling down on them from above.